Many new owners of the all-new 2017 Ford Super Duty are astonished as to why Ford made it so complicated to get the factory LED headlamps as an option by having to combine it with other options that start to add up quickly. The most apparent mod right after driving the truck off the car lot is to find a way to get the Ford Quad Beam LED headlamps. But after lots of research and debating, we get to realize is not as easy as it should be. The 2017 F250 LED headlight conversion can be extremely costly and difficult for most. The options for those that don’t want to dig too deep on the OEM LED Headlights are bound to have one essential choice, which is to retrofit their headlights. A headlight retrofit, in essence, is to give the correct optics to your stock reflector headlights. Swapping led bulbs alone would result in lots of glare, distorted beam pattern, a significant reduction of the light output and mediocre high beams. But… There is an excellent way to retrofit your stock halogen reflector headlamps with high-performance LED Projectors and looking great while doing it. Simply put, these clear lens optics will put the performance of the factory Quad LED headlights to sleep. We are talking many many more lumens, sharpest cutoff line, and extra wide beam angle. If you are looking for the right 2017 super duty aftermarket headlights, then look no further. 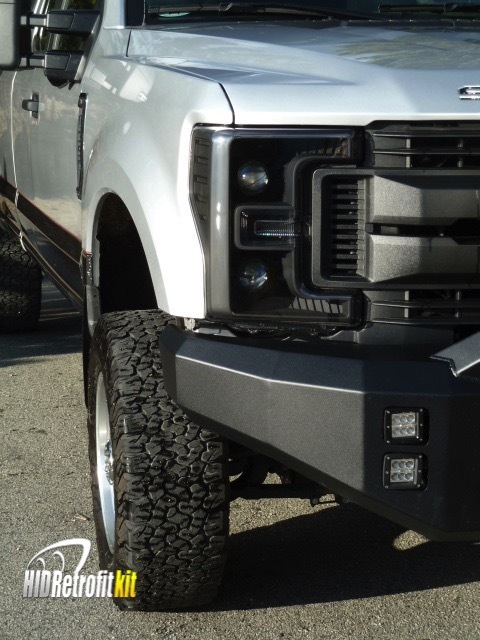 You have arrived at the source for customizable LED projector headlights for your Ford truck. Learn more about what you can achieve on your headlight project by visiting our retrofit service page or run a search to look at our design ready options!